Please refer to the iOS/Android Comparison Chart for full features.Please review user manual attached below for item troubleshooting. Track your speed, distance and route with the integrated GPS and GLONASS. Enjoy your favorite tunes with Google Play Music and 4GB of onboard storage. 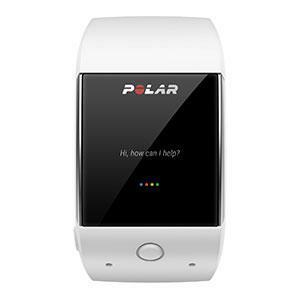 With Polar’s advanced training features and 24/7 activity tracking, Polar M600 offers personalized guidance and feedback for training and daily activity. 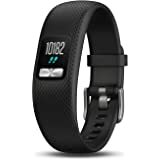 Track your workouts, 24/7 activity, steps, distance, calories burned and sleep. 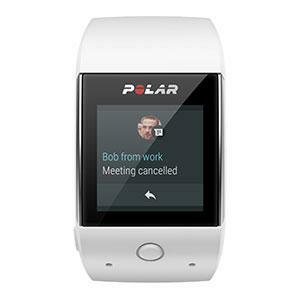 Polar’s unique Smart Coaching features turn your activity and training data into actionable insights. Polar Smart Coaching does the data-crunching for you so that you can focus on what’s important. 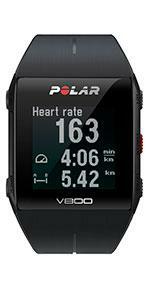 Polar M600 features the proprietary Polar wrist-based heart rate measurement technology, optimized for Polar M600. 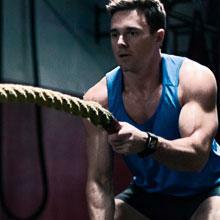 Simply tighten the band and you’re ready to train. Polar M600 allows you to make the most out of the Android Wear 2.0 smartwatch OS. Receive calendar notifications, read and reply to messages, listen to music, find yourself on the map and access even more apps via Google Play – all on your wrist. See notifications and meetings, ask Google for help, respond to messages, find yourself on the map and get live weather forecasts – all on your wrist. Control music right from your watch. Go phoneless with Google Play Music and 4GB of onboard storage for music playback. Android Wear 2.0 gives you the power to personalize the information shown on your watch faces. 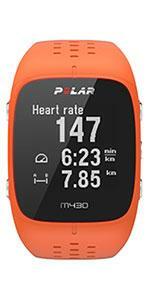 Polar M600 is robust, waterproof and built to last. In addition to the color touchscreen, it has 2 buttons for quick control during training. 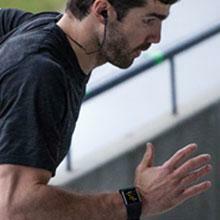 Run, swim or work out... Polar M600 does it all. Polar Running Program sets you up with a personal plan for your next event. 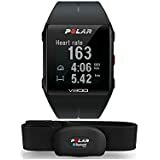 With the Polar H10 heart rate sensor you can crush goals in the weight room and connect to your favorite gym equipment. You can even track your laps in pool with swimming metrics. 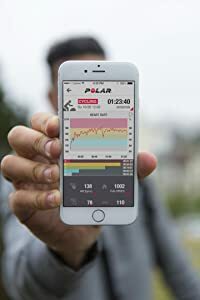 The Polar Flow app and web service allows you to plan your training sessions and set targets, draw motivation from tracking your long-term progress and share your training with friends – or the whole world. Powered by Android Wear 2.0 smartwatch OS. 4GB internal storage for music and apps. Durable and scratch resistant Corning Gorilla Glass 3 display. Up to 2 day battery life/8 hours of training (with Android phone), 1 day/8 hours of training (with iPhone). 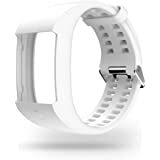 Equipped with GPS and GLONASS, 6 LED optical heart rate measurement sensor, Accelerometer, Ambient Light Sensor, Gyroscope, Vibration motor and Microphone. Waterproof for up to 10 meters (IPX8), suitable for swimming. Bluetooth 4.2 and Wi-Fi 802.11 b/g/n connectivity. Changeable silicone wristbands in black, white and red. 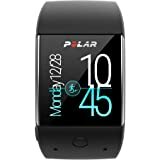 Polar M600 is the best in market sports optimized sport watch including the so far missing killer app for Android wear. 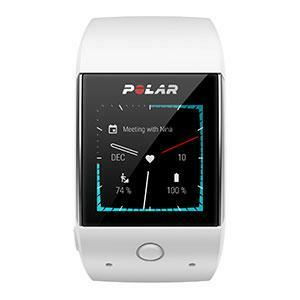 In M600 we complete the Android wear feature set with Polar Smart coaching and training experience. 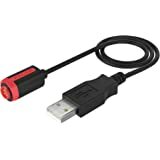 I’ve literally purchased hundreds of items from Amazon and this is my first-ever review written on Amazon (or anywhere for that matter). 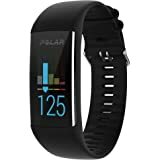 I’ve had the Polar M600 for about a month now. I will admit the first device I received from Amazon had a defective microphone, where the ‘Ok Google’ feature wouldn’t work. 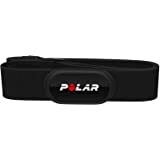 Polar and Amazon customer service were great and Amazon quickly replaced the device. I am a multi-sport athlete, where I run distance, trail running, hiking, obstacle courses, skiing/snowboarding, golf, biking, and occasional softball. I started out with the Motorola MotoActv years ago as a gift and had a great experience with it. 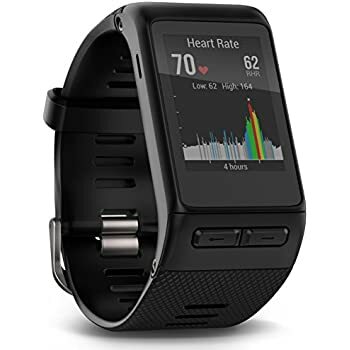 Obviously outdated today and lacking full activity tracking, heart rate monitoring, and the smart app experience, I decided to jump onto the smartwatch bandwagon. 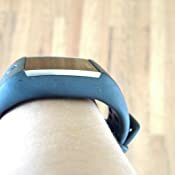 When smartwatches really started becoming popular a couple years ago, I was probably one of the first people to buy the Samsung Gear S (3G version). I later upgraded to the Samsung Gear S2 Classic (3G version). I am an Android guy, but I have no loyalty to the operating system as long as it works. So I didn’t care if it was Android Wear, Tizen, Apple, or whatever proprietary OS it used as long as the above criteria could be met. There are some very good fitness watches out there today. Some with smart notifications. One of the biggest drawbacks for me is that I like to run and workout while listening to music but without hauling my phone with me. A watch and Bluetooth buds are the perfect combination for me. Problem is that there aren’t that many options out there with onboard music storage. The Gear S, Gear S2, and Polar M600 are the only watches I can speak to from personal experience. My feedback on the others below is purely based on research and critic and user reviews. Sony SW3 runs on Android Wear and has GPS and onboard music. No HR monitor however. 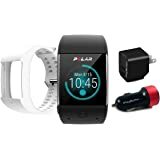 Reviews indicate quick battery drain w/ GPS and music streaming. Moto360 Sport runs Android Wear and has GPS, onboard music, and HR sensor. Battery life with normal use is about 1 day and using GPS alone is about 4 hours. Not sure how much time you get w/ GPS, music, and HR running together. 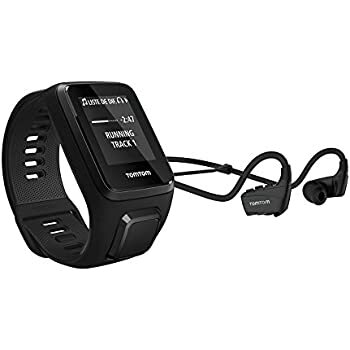 TomTom Spark 3 Cardio (or Adventurer) has GPS, heartrate sensor, and onboard music. No smart notifications or add’l apps however. Good battery life. A tempting alternative if you don’t care about the smartwatch/notifications part. Apple Watch Series 2 has GPS, heartrate sensor, and onboard music w/ Apple’s OS and notifications. Reviews indicate decent battery life (4-5 hours with GPS running). 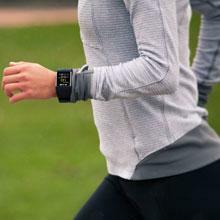 However, when running GPS, heartrate sensor, and streaming music, it’s expected the battery drains much quicker. Also claims 18 hrs battery life with normal use. So, you have to charge every night and maybe wouldn’t use for sleep tracking. No interface with an Android phone, so I haven’t pursued this. Would likely be a solid option for iPhone users. 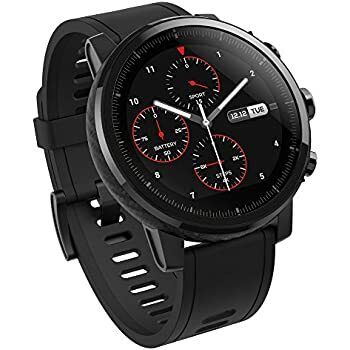 Amazfit Pace being released next month, which includes GPS, heartrate sensor, and onboard music w/ its own OS and smart notifications. Claims excellent battery life. Unclear as to what sport profiles exist beyond running, walking, hiking (ie skiing/snowboarding/cycling/golf/indoor workouts/etc?) or add’l apps for download. Interested to see what comes of this. Samsung Gear S and Gear S2 both have GPS, heartrate sensor, and onboard music with the Tizen OS and smart notifications. Both of these watches are great smartwatches first and okay fitness watches second. With normal use, both easily last two days. The Tizen OS is easy to navigate and the app store is growing rapidly. 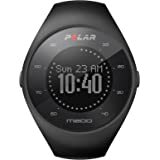 The two drawbacks of these devices (and the reason why I switched to the Polar M600) are their limited sport profiles and battery drain with GPS/music streaming/HR monitoring. First, Samsung S Health is a great fitness app… on a phone. 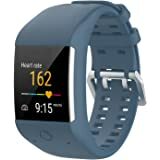 On the watches themselves, the sport profiles are limited to running, jogging, hiking, stair-climbing, cycling, and walking. Nothing specific to track indoor strength training, crossfit, circuit training, aerobics, or any other outdoor activities like skiing/boarding or golf. While these other profiles exist amongst hundreds of others on the S Health phone app, Samsung has yet to expand the # of profiles (or customization of) on the watch. But okay, fine. I could live with what was available on the watch and find 3rd party apps for other sports. The major problem is this. If you are running with GPS, heart rate sensor, and streaming music (even with 3G cellular service turned off), you’re lucky to get over an hour of battery before it dies. I ran a half marathon with the Gear S (no music, just GPS and HR), and it had about 15% remaining after 1 hr 47 mins. I regularly would run 5-6 miles with the Gear S2 (with GPS, music, and HR) and would have under 20% remaining after 40-50 mins. The final straw was when I was running a 10-mile event and the S2 died under an hour (only using GPS and HR). It seemed that its GPS accuracy was way off as well. 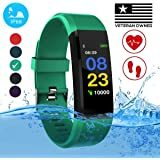 Personally, I decided that my priority was for a fitness watch that could reliably last through whatever sport or activity I was doing. 2nd priority was for something with onboard music storage and smart notifications. Even though I don’t listen to music during long-distance events, I have low confidence that the Samsung watches would last (verdict is still out on the new Samsung Gear S3). And my confidence is even lower for multi-hour events like a ToughMudder or Spartan Beast. 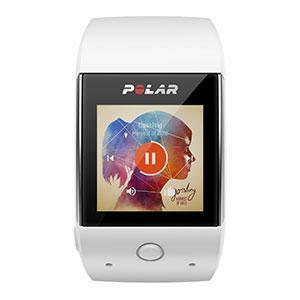 In comes Polar M600. 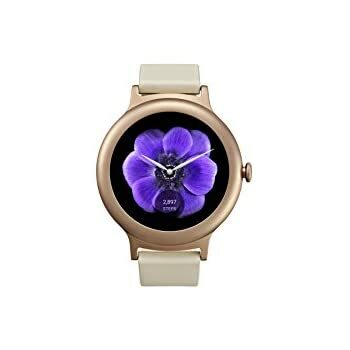 Yes, this looks like a sport watch. Not your classic watch look. As stated above, I’m into sports and interested in function, so I don’t really care how it looks. I don’t think it’s any bigger than the Samsung S2. I was a little concerned as I have smaller wrists, but after putting it on, I think it looks fine. Heart rate sensor uses an advanced six LED sensor and seems to be very accurate. I easily created a music album with 300 songs on Google Play Music app and wirelessly transferred my music to my Polar M600 (basically the same setup as music transfer for the Gear S2). Android Wear works great and the apps automatically sync to the watch. Subtle vibration on my wrist for notifications. Some say it’s too weak a vibration, but I have no problem telling when something comes in. 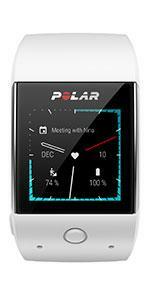 The Polar M600 is definitely a fitness watch first and smartwatch second. The Polar Flow app works very nicely and syncs automatically between your phone and watch. Sleep tracking works well. And plenty of metrics to compare from workouts, like speed, heart rate, and altitude. GPS/GLONASS seems very accurate as well. I live in Pittsburgh, so mostly cloudy all the time with a few months of clear skies. Despite that, it normally takes about 10 seconds to grab the GPS signal. Even downtown around buildings, it picked up GPS in under 30 seconds. Polar Flow also lets you customize which sport profiles you want available on the watch, which is very nice. You can choose up to 20 profiles to select directly on the watch (that covers any basic or extremist need for athletes). 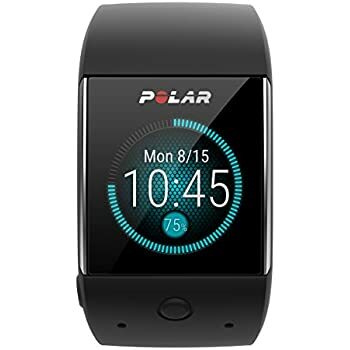 Polar has a golf profile, which I haven’t used yet. 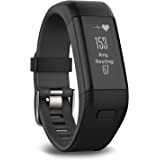 However, I believe it is just an activity tracker and not a shot tracker. Luckily, there are several Android Wear apps available to track your golf game that I plan on trying in the spring. Now to the best part, battery life and lasting through my workouts. 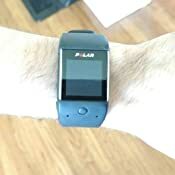 I basically exercise daily, and am using some combination of HR/GPS/music streaming or all 3 together for an hour each day. 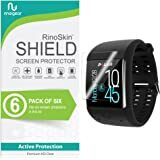 With workouts on top of regular use for notifications/etc, this watch easily makes it over 2 days. Most mornings after a full day of use + workout, I still have above 60% remaining when I wake up. Many days, closer to 70%. The watch also charges very fast. I take it off for about 30-40 minutes in the morning when showering/getting ready for work, and it reaches 100% charge. Sure it would be nice to last a week+ without charging. But I don’t mind taking it off for the 30 mins and it’s also nice knowing that I can get another day or two out of it anyways. 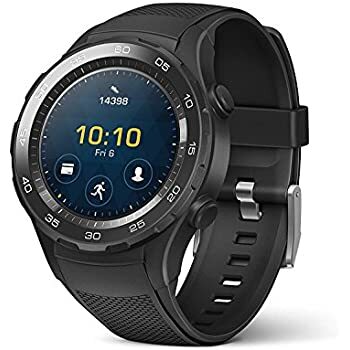 Any watch running a smartwatch OS (whether it is Tizen, Apple, or Android Wear) is going to eat battery faster than the other fitness watches (like Garmin, TomTom, or FitBit). It’s just the nature of having an OS constantly running. That will hopefully continue to improve over time, but 2+ days is pretty good right now. The real test for me was how it would hold up on outdoor runs, using GPS, HR monitoring, and music streaming. After testing it on multiple 5-6 mile runs, the battery drain averages just around 8% (40-45 mins timeframe)! That tells me that this watch could last 8-10 hours using GPS/HR/music streaming. That competes with the TomTom Spark 3’s GPS life, which still lacks the smart notifications/Android Wear feature. Despite the mixed reviews on the M600, I’m happy I decided to give it a chance. So far, so good. 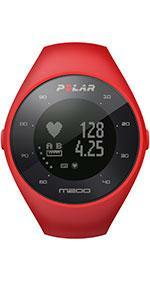 Overall the M600 is mostly an Android Wear smartwatch with the Polar Flow app built in. It is a step up from the Moto360 Sport. 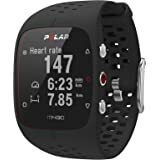 But the watch itself doesn't contain much data, except current daily steps, distance, & calories burned - (now with an Polar Flow update, it will also store the data from your last training session). You need the app and website to get everything else. 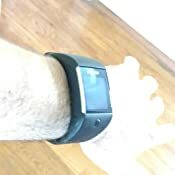 It have GPS and onboard music so makes a good stand alone running watch from that perspective. The biggest flaw is the vibration intensity is very poor. 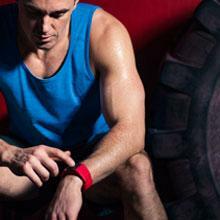 Fitness Tracking – VAHR – gives you the most information on the watch itself. M600 really gives you nothing on the watch as data except for current days steps, distance, and calories burned (and now last training session). No history at all. Battery Life – VAHR easily the winner. It lasts a week. 2 days for the other two. Waterproof – M600 and VAHR go in the shower and can be used to swim. The MB2 not so much. Core App – Microsoft Health is great, and their internet site is the best. Garmin is good. 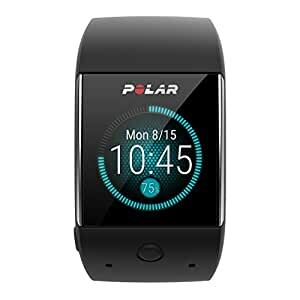 The Polar is app is pretty minimalistic. 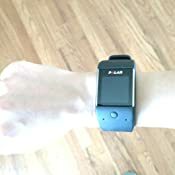 You need go on their internet site to see data that the other 2 provide in the phone app or even on the watch itself. OS – Android Wear provides the most apps and most flexibility. You can respond to texts, notifications. Use the Microphone to execute commands. It is also far from perfect. Kind of clugy. I am also looking forward to Android Wear 2 coming this fall. Garmin Connect gives you a few things, most of the third party apps don’t work very well, though. Microsoft Band works best with a Windows phone. Not too much gained with an Android phone. Bonus – If you want a truly stand alone watch for running, the M600 is the clear winner. Android Wear allows you to store MP3s directly on the watch itself. Plus with GPS you are all set. 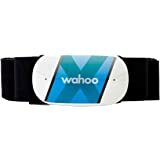 The other 2 have GPS but no onboard music, so you will still need your phone on the run or some other type of mp3 player. Added update - Onboard music works much better than on the M600 than the Moto360 sport, less skipping. I first tired some completely wireless earbuds (Syllable skipped frequently, Simger Beats skipped a lot). But then settled on the JLab Audio Epic 2 and only get occasional skips. Google Play still needs to be redesigned on Android Wear.